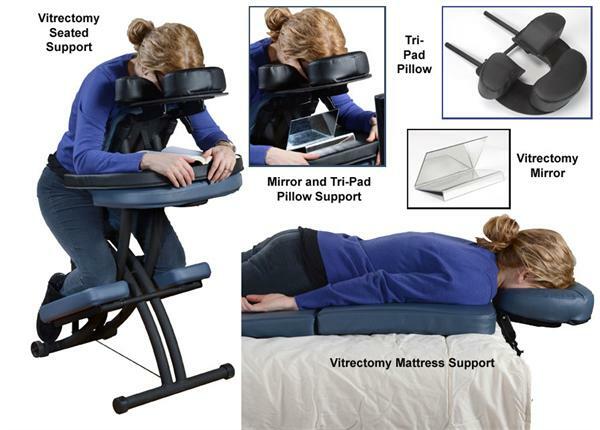 Our Deluxe Vitrectomy Recovery Package includes everything you need for optimal comfort and support during your recovery. The Mattress Support includes the patented Nirvana Mate Mattress Cushion and Face Support. Designed to allow proper positioning during sleep, the Nirvana Mate alleviates tension on your spine and includes a breast cut out with insert to allow women and men to be comfortable during rest. The Face Support easily fits between your mattress and box spring to comfortably support the face. The Face Support can also be used at a kitchen table or deskfor eating or working.